"We need poetry as we need love and company," according to Miller Williams. Making a Poem speaks to us all -- those of us trying to write a first poem, those who have published volumes of poetry, and anyone who cares how the world and language fit together. Distinguished as a poet, a teacher, a scholar, and a publisher, Williams traverses a wealth of topics. He explores poetic techniques of line break, rhythm and meter, and the development of verse forms. In our technological age, he makes clear that poetry is essential to the human soul, showing the connection between scientists and humanists. 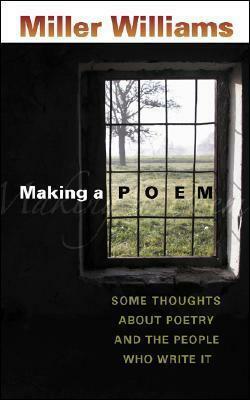 Williams draws from experience to describe the importance of teaching poetry to prisoners, the value of the university and the small press in fostering poetry, and the relationship between writer and editor. Making a Poem is an intimate, conversational treatise on poetry by a man of letters with decades of practice in both the business and the craft of verse. Readers will take away from this delightful book a deeper appreciation of the poet's art and the vital role poetry can play in their everyday lives. Miller Williams is the author, editor, or translator of thirty-three books, including fourteen volumes of poetry and Patterns of Poetry: An Encyclopedia of Forms. Among his many honors are the Amy Lowell Traveling Scholarship in Poetry from Harvard University, the Poets' Prize, and the Prix de Rome for Literature and the Academy Award for Literature, both from the American Academy of Arts and Letters. He was inaugural poet for Bill Clinton's second swearing-in as president. Williams took academic degrees in the sciences because a college counselor told him his entrance tests indicated no verbal aptitude. As a young man he played the clarinet and saxophone in a jazz combo. He is the father of three-time Grammy Award--winning singer and songwriter Lucinda Williams.